Two draft decrees relating to the implementation of the recently adopted bill reinstating compulsory military service for young people aged between 19 and 25 years for 12 months have been adopted Thursday (Feb.7) at a Ministers’ Council held under the chairmanship of King Mohammed VI, Supreme Commander and Chief of the General Staff of the Royal Armed Forces. The two drafts determine the modalities of counting, selecting and integrating conscripts for military service, the procedures for granting exemptions from this service, and define the procedure for voluntary conscription for women and Moroccan expatriates. The drafts also set the wages, allowances and benefits for recruits, as well as the special allowances granted to recruits serving in the southern regions, said a statement read out by spokesperson for the Royal Palace AbdelhaK Lamrini. In a bid to activate the provisions of the law on military service, the Sovereign gave his instructions to work on recruiting ten thousand troops during the current year. This number will be raised to 15,000 next year, the spokesman added. According to the provisions of the bill on military service, young recruits will have the possibility to sit for recruitment exams organized by the Royal Armed Forces (FAR). The text also provides for granting disability pensions to young people who would be victim of accidents during their military service. King Mohammed had stressed the importance of military service for young people, deeming the conscription enhances the sense of belonging to the homeland. In a speech at the opening of the fall session of Parliament last October, the Sovereign made it clear that it will concern all Moroccans, without distinction. 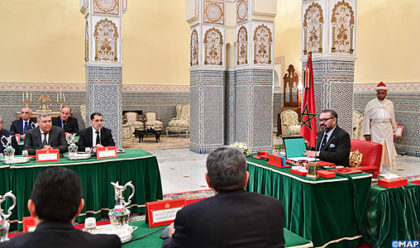 “It must be emphasized that all the Moroccan citizens concerned – without exception – are equal, regardless of social background, diploma or education”, he had said, adding that the draft also “gives access to training which opens up opportunities for the professional and social integration of qualified conscripts who demonstrate a sense of responsibility and commitment”. At the end of the 12-month training period, young people who complete the service would receive payment according to the Bill, which promises to reward conscripts with grades according to the Royal Armed Forces’ current hierarchy standards. The draftees with technical and professional skills may be called to fulfill specific missions within the military administration after completing their training.